I am sure that by now you have had your first cup of the day? Well that is quite alright! 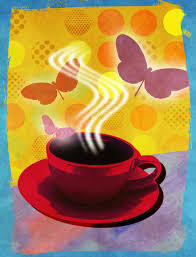 Our challenge for today is not to give up coffee, but to just reduce our intake with one cup. Replace it with a glass of water. The same goes for your daily soda intake. Replace one to two glasses of soda with the equivalent amount of water. The aim is to hydrate our bodies. Drinking water is very beneficial for our bodies, as about 60% of our bodies consists of water. We need adequate water to maintain the fluid balance. It helps with digestion and delivering nutrients throughout the day. Drinking water can help us to consume fewer calories and it helps to flush toxins from our system. Dehydration impairs our energy levels as our muscles need sufficient water in order to function properly. Dehydration can also lead to headaches. By replacing a cup or two of coffee with pure clean water can boost your metabolism, help clear up your skin and lead to an over-all feeling of wellness. Give it a try. If you are brave enough you can even try going without coffee and sodas for a whole day, replacing it with water. Have a happy day, we'll talk again tomorrow.